This year's Overland Expo started out so promising. We pulled into Mormon Lake under partly cloudy skies, checked in and received our packets then made our way to the campground. The gale force winds that usually greet us were absent, and the temps were in the pleasant 60s. Even better, this year the campground was laid out in rows marked off with cleverly named streets. No more willy-nilly free-for-all camping that left us trapped in a sea of 4x4s like the previous years. Our friend Mel had staked out an area for everyone in our group; we pulled in next to him and popped up. This was gonna be great. Thursday afternoon before Overland Expo 2015, sunny skies and all is well. We pulled out our chairs and watched the procession of campers, trailers, RVs, and various outlandish vehicles drive by, guarding the spaces around us for friends that were arriving late. The clouds that had been hanging off to the east started to move over us and it was getting a little chilly, but no worries. It was almost beer time and we had jackets. The wind kicked up a little. No surprise, this was Overland after all. Then the wind carried in a few raindrops. We put up our hoods. No big deal. We're overlanders! We are tough! We cooked dinner huddled around the stove, as much for warmth as to shield the burner from the wind and rain. Socializing was made more difficult by chattering teeth and the cold, which had dipped into the 30s by the time the sun went down. Everyone decided they were really tired and went to bed just after 9:00pm. The view from under our tarp. Rain, rain and more rain. The morning brought rain mixed with torrential rain and occasional snow flurries. The surrounding "dry" lakebed had turned into a gluey, boot sucking muck, a charming mixture of silty soil and cow dung that coated our shoes in alternating layers of slick mud and the tiny lava rock they had (somewhat belatedly and futilely) laid down on the footpaths. Walking was a chore; haul one heavy boot out of the muck, search for the driest, least deep area to place it and do it all over again until you reached the drier Expo grounds. By the time you got to the concrete each foot weighed at least 10 lbs and everyone was walking like Frankenstein's monster. 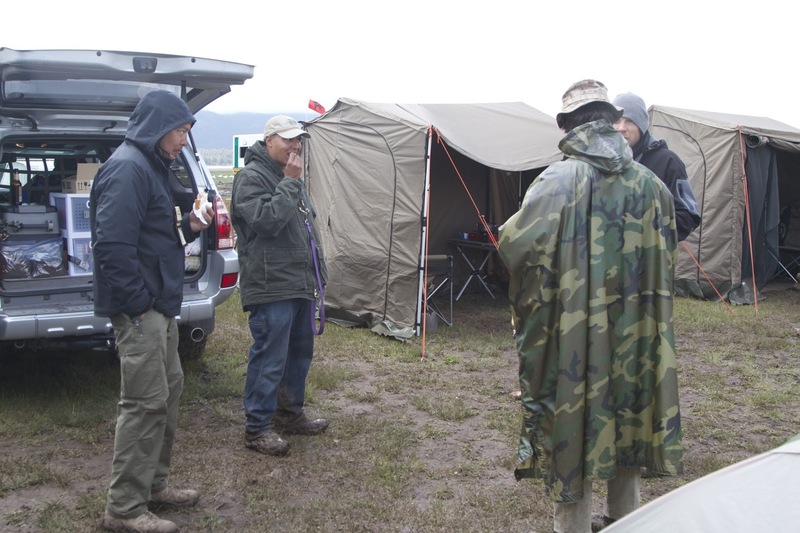 I felt sorry for the lodge: the classes that were held inside were coated in pathways of mud tracked in by the hundreds of boots tromping up and down the stairs. 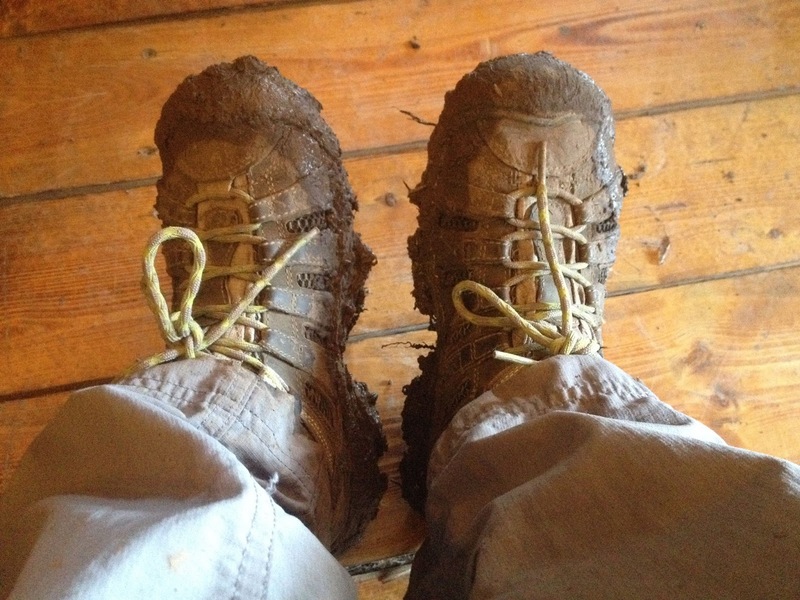 My boots, after I had cleaned them off to the best of my ability. Saturday morning the weather changed. 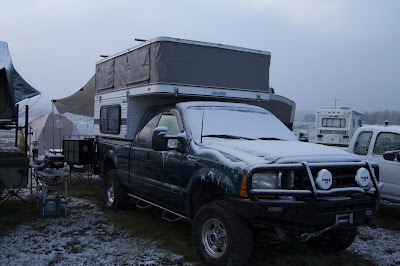 Overnight three inches of wet, heavy snow fell, coating the trucks and tents, weighing down our awning until it bent the poles inward. Mark had gone out a few times during the night to flip the snow off, leaving piles of snow around the edges of the awning that melted in the morning, creating a deeper, thicker mud moat around our camp. Does this look like fun? Believe me, it was colder than this looks. Our truck that morning. 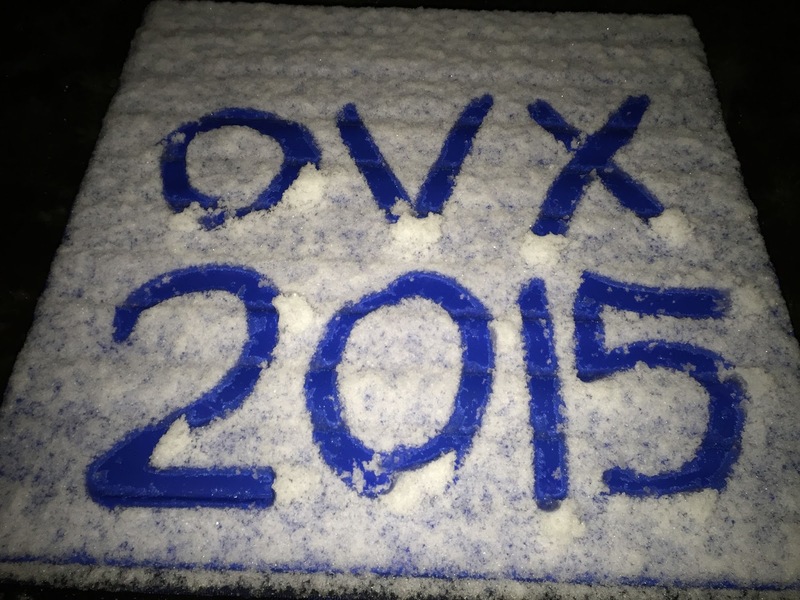 It was actually warmer inside with the insulating layer of snow. Mel's rig. He stayed in bed until the last possible minute that morning. At this point, a lot of our neighbors decided they had had enough. Unfortunately, by this time the mud was so thick many of them couldn't get out on their own. Teams of recovery vehicles started roaming the campground, pulling helpless RVs and overloaded trucks and trailers out of the muck. Of course this churned up even more mud and some of the recovery vehicles needed recovering. In the end, the tow trucks called in from Flagstaff refused to come out to the campground and it was up to a guy named Wolf and his deuce and a half, an old WWII cargo truck. He was pulling people out for donations to fill his gigantic diesel tank, which was getting a serious workout. Yeah, they don't make 'em like they used to. We watched all this with interest and dread. We weren't planning on leaving until Monday morning, and we had been nervously monitoring the weather forecasts every few hours. It was supposed to start clearing Saturday afternoon but during happy hour that evening, we watched as the heavy rain turned to hail then snow showers. We had been planning on having a potluck meal that night, but that sealed it: we went to the pizza place, the best 60 bucks we've ever spent. Mel, Chris, Max and Jason braving the rain for a sandwich. This is how most of our meals were spent: standing up, eaten as quickly as possible. 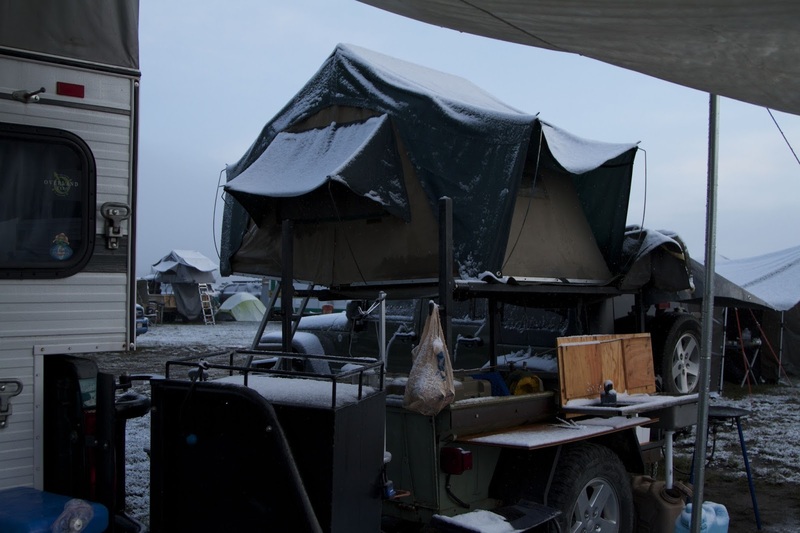 When we returned to camp we found it had become a little island in a sea of mud. 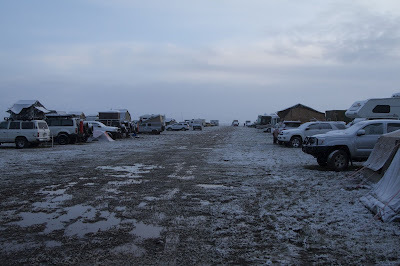 At least half the campground had vacated to higher ground and/or warmer climes leaving us with few neighbors. That night was quiet, except for the whirring of those lucky enough to have heaters in their rigs. Hey, there's no shame in it; we set ours to go on at 48, and it was cycling all night. Sunday morning brought hope. Sunshine was starting to break through, and by the afternoon it turned out to be a beautiful day. Rays of semi-warm sun bounced off the mud puddles and danced on the small lake that had once been the volunteer campground. A lone Oz tent was still standing in the middle, a testament to the sturdy tent and it's stubborn owners. They must have packed waders because there was no way to get out of there without sinking to the knees in the mud. 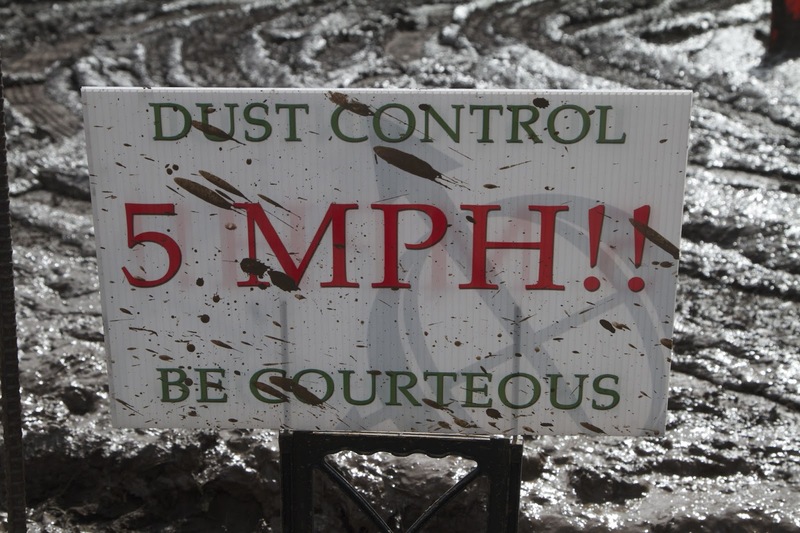 The nice thing about dry lakebed camping: as quickly as it can turn to muck, it dries out all the quicker. 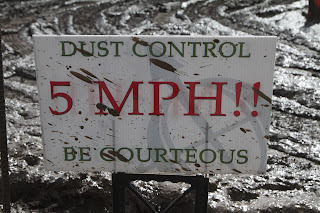 By early afternoon, if we were careful, we could walk across the campground without breaking through the crust. Only in the worst places–the roads that had suffered the most damage when people had gotten bogged down–were there mucky places left. 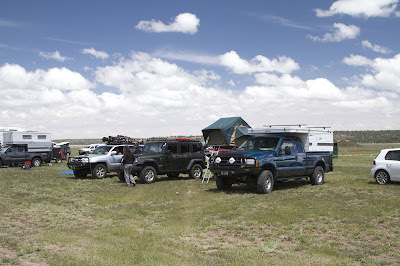 One of our favorite classes during our first Overland Expo was taught by Martin with Adventure Trailers. He was teaching us tire repair, a skill Mark has used quite frequently in the past few years. The lesson that stuck with both of us, though, was this: when faced with something that's stopped you in your tracks–say, a flat tire–and you feel panic setting in, the first thing you should do is stop and make a cup of tea. Take a moment, think it through, and by the time the kettle boils you'll have realized how to get at the problem with a clear, calm approach. 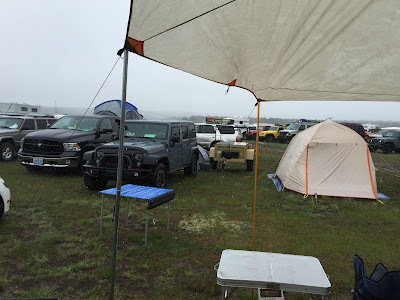 By Monday morning, our truck and camper were mostly dry as we packed up, and we drove out of there with nary a slip of a tire. Martin was right: sometimes it pays to sit tight and have a cup of tea. A nice blazing hot cup.